Apple had their big developers meeting this week. In it, they highlighted updates to everything from their laptops to their cloud technology to their new Pandora copycat. This post isn’t about any of that. It is, however, about the one item that may have impact on the employment game. It was described as a way to browse through apps based on geographical popularity, thus localizing the app discovery process. 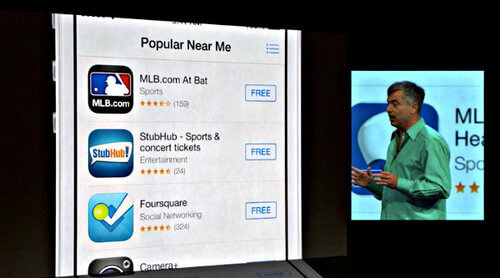 For example, if you live in New York and browse apps popular in the area, you might see an app for the Yankees. Likewise, someone in Los Angeles could see an app for the Dodgers. Finding a job is largely local. Until this latest feature, employment-related native apps had been general in nature. Apps like CareerBuilder and Indeed have ruled, while niche players are mostly bypassed. Now, local job boards have an opportunity to be found in their local markets in favor of bigger players. Now, an app for, say, jobs in Orlando, Florida could show up in a search for “jobs” to someone in Orlando. Or someone browsing top apps in Seattle could find a local job search apps in the area even though they weren’t even looking for employment. This new option should be a boon for local newspapers, which have had challenges with their place in the app ecosystem. There’s no reason for Chicago Tribune to be a top app in Chicago, for example. And if you’re a local newspaper that doesn’t have an app, complete with classifieds, you may want to develop such an app. It’s potentially as important as Google was in creating niche in the early days of the Web. When site owners understood that ranking for “Cleveland jobs” was easier to do as a niche than it was as a general site, it sparked the birth of tens of thousands of sites that wouldn’t have existed in the previous environment. To date, Beyond.com is one of the few general job sites with a local strategy. The developer behind iPhone apps like Manhattan Jobs and Phillyjobs may have a leg-up on the near-me trend, and it will be interesting to see how their exposure changes, if at all, once the new iOS goes mainstream this coming fall. If they do get favorable placement, I’d look for a wave of localized jobs apps to take-off. And if I had to guess, they would’ve gotten there be being downloaded by a good number of local residents, which would obviously be aided by promoting the app in their local market. The evolution of app discovery – much like every medium before it – is starting to segment and specialize. All kinds of content – including jobs – are bound to follow suit.